Last time I was this close to the stunning slopes of Panwali Dwar was in 2012 during my Sunderdhunga Trek. Today I looked down into that closed valley floor from nearly 2000 meters above. The natural pedestal that afforded this view was summit of Mt. Baljuri, sitting at 5922 mtrs on the ridge forming natural boundary between Sunderdhunga and Pindar valleys. The chance discovery of Baljuri as a potential first peak attempt happened couple of years ago during a discussion in an online community. All the armchair research, however was only academic at the time as I had no intent of attempting a peak. It was but bound to happen in due time, and so when we decided to go for a summit in 2017, Mt. Baljuri was the obvious choice. The usual approach to Baljuri follows same route as much more frequented Pindari glacier trek up until a few km up from Phurkiya. 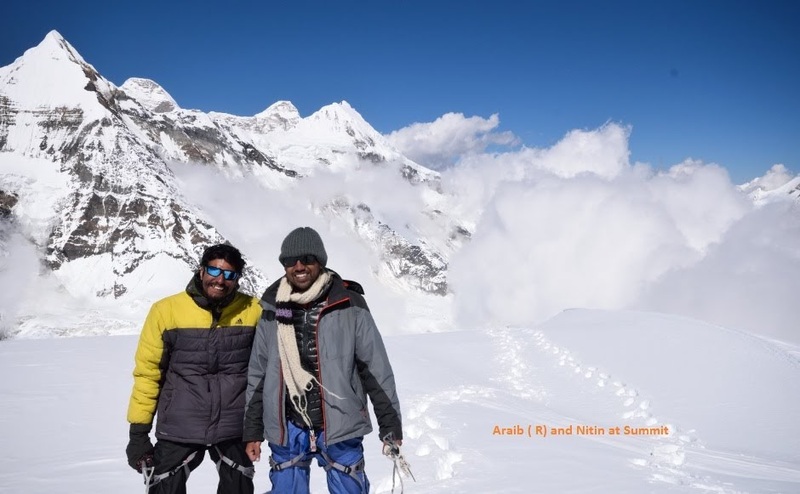 Two more camps above base camp are employed to negotiate the steep climb from base camp through grassy hill leading to moraines and further to summit through Baljuri Col.
Our team initially made up of Sunil, Adil, Nitin and I but at the last moment Sunil had to return due to dengue. We were joined by Girish who was to accompany us for some distance in the mountain. We had planned to get porters and a local guide from Khati. We started from Bageshwar on 25th Sep, which marked end of 4 days of heavy downpour. Couple of teams that had left for Pindari and Traills Pass faced the full brunt of rains including washing away of the Pindar bridge. We however crossed the under construction bridge on the way to Dwali and apart from few instances of broken trails there was no major trouble from the rains of previous week. The trail between Khati and Dwali had however changed considerably compared to what it was 16 years ago during my first foray into Pindar Valley. This unwanted change was brought about by heavy rains of 2013 which was considerably less in Kumaon but still catastrophic enough to cause major landslides. We crossed Pindar through make shift bridge, constructed on the spot by our enterprising party. In an immense show of strength, our porters brought two logs and placed them on the narrowest part of river. Crossing the river led us to beautiful meadow used as grazing grounds for animals of local herdsmen. The base camp sits little higher on this meadow at an elevation of 3600 mtrs. Baljuri is veiled by the mountain which rises steeply from the banks of Pindar River. Across the river Nanda Kot and Changuch peaks tower over small flat area leading to Baba’s hut and Zero Point. The gradient up until the BC is pretty gentle and Khati to BC can be easily done in 2 days. We met another team led by well known mountaineer Dhruv Joshi. They informed us of a shorter route to Camp 1 which is more direct climb through the hill rising from base camp. 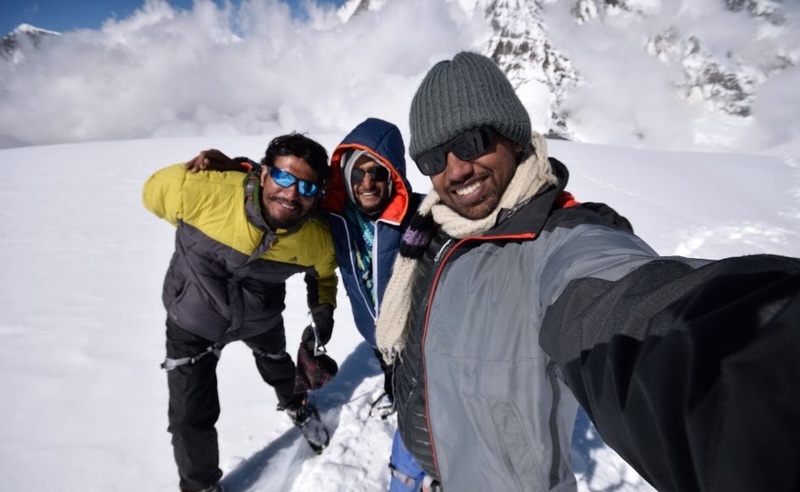 Our guide Laxman was not a seasoned high altitude trekker and had not been to any technical trek or climb. The route above Camp 1 was virgin territory for all of us and we decided to act on the advice. As visible from the BC, route further up was steep climb through the hill without laid out trail. Within few hours of climbing we were considerably higher than Zero point. We could see a rather large camp set up at zero point which we assumed was of the Japanese team aiming to summit Nanda Kot. Camp 1 sits at the start of moraines at 4600 mtrs perched at the end of the ridge leading to common massif of Panwali Dwar and Baljuri. The peak almost directly over head from here is Nanda Khat which looks menacingly difficult from the face towards us. Slopes from Changuch and Nanda Khat converge in shape of Pindari glacier visible on the other side of the camp. Camp 1, although not on snow, was still not the most comfortable place as water was a fair distance away and we could find just enough flat space to pitch our tents. We heard lot of rumbling throughout the night comfortable in our knowledge of safety owing to distance from Nanda Khat and Panwali Dwar faces. Camp 1 was as far as our porters would accompany us. We distributed additional loads of food, fuel and equipment and set out in a clear morning. Our porters, visibly cheerful walked us off till the snout of glacier. This was as far as their insufficient gear could allow them to travel. Even Laxman did not bring sunglasses and snow shoes of his own but we had guessed as much and had additional gear for him. Not having to carry the heavy snow shoe was no reward as the ill fitting rented double boots were more troublesome on feet. Climb from C1 continues on moraines for some distance and passes through a narrow passage not more than few feet wide. Hard ice block at the mouth of the passage made for a tricky crossing as we had not strapped our crampons yet. However it was not exposed and we were able to cross it without much risk through debris accumulated on it. Further up slope was not very steep. Snow however was very soft and we were plodding in the snow much earlier than we expected. Since we were on the mountain now, there was no stream and we had to make a stop for melting snow for water. Visible crevasses and some seemingly hazardous depressions forced us to take detours around them leading to a lengthy haul to Camp 2. We reached C2 when sun had receded from that face and we made our camp in bitter cold. C2 was established below Baljuri Col and closer to visible Panwali Dwar. We could sense the high elevation – Panwali Dwar was close enough to see features on the mountain. GPS confirmed the altitude to be 5200 mtrs leaving some 700 mtrs climb for summit from C2. A large crevasse separates a relatively flat ice field from the steep wall leading to the col connecting Panwali Dwar and Baljuri. It was last day of September and bitterly cold in the camp. Nitin and Laxman occupied the smaller tent and rest of us were in another, vestibule of which also served as kitchen. Hard set ice had to be chopped using Ice axes to melt for water. Our Kelty tents were to face their first real challenge as the night crept in. On summit day, 1st October, we were up at 3 am to leave in a clear night however it was 5:30 when we actually started for summit, having spent 2 hours sorting out gear, roping up and wearing frigid double boots and crampons. It was still very dark without moon and snow was unexpectedly soft even at the early hours. We could see fixed ropes of previous group leading to Baljuri Col ( which Laxman removed on our way back). It took us 30 mins to reach Baljuri col, reaching there just before sunrise. 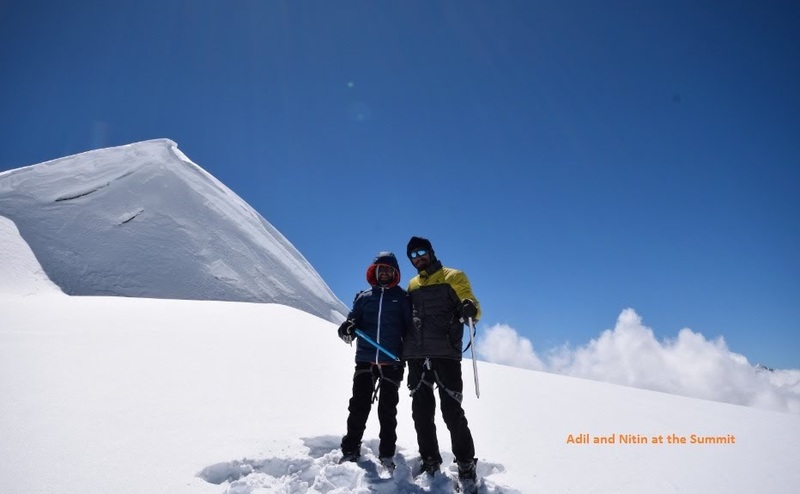 We had stunning view from the col dominated by Maiktoli , Sunderdhunga col and Panwali Dwar on Sunderdhunga side and Nanda Khat, Changuch, Nanda Kot and few smaller peaks on Pindari side. Teams going for Panwali Dwar use the same route till this point. We then turned left towards Baljuri and chalked out route to the summit through maze of crevasses. The approach was excruciatingly slow due to soft snow and at 11:40 we had reached 5700 where we made another stop for melting water. This was already highest anyone of us had been in our previous expeditions. Laxman, feeling effect of altitude declared end of his climb, Giri decided to accompany him while he waited for our return. Slope ahead was extremely steep albeit unexposed and thus not requiring roping up. Adil, Nitin and I left for summit with clouds approaching from below. From behind pyramid shaped Panwali Dwar, we could now see twin peaks of Nanda Devi. Adil reached what seemed like summit to us from below but continued his climb to our disappointment. Dragging our feet in thigh deep snow, we completed last leg of the climb and finally reached true summit. We could see far into Kumaon and Garhwal from the summit. Of course it was impossible to discern one place from other from there but I took great comfort in knowing that from all those places I would be able to mark this exact spot. We were finally at a summit.